It’s no secret that I’ve been an outspoken critic of Corey Stewart for a long time. Upon learning about him and his history in Prince William County a couple of years ago, I’ve found myself increasingly outraged and disgusted by his brand of politics and his general approach to being a public servant. From his pivot away from taking on developers in our county, to the xenophobic racial profiling policies he championed a decade ago, to the Trumpian white supremacist rhetoric (wrapped in an idolatry of the Confederacy) he peddles, he embodies everything that is wrong with modern day politicians. Like Trump, his actions and rhetoric play to the worst in people, and projects a lack of any real conviction. The ultimate sign of privilege is the luxury to truly stand for nothing while still achieving powerful positions and influence nonetheless. I write this piece not to just decry Corey Stewart, though. His general election opponent this year – Senator Tim Kaine – is a public servant with a long history of working with (and for) people from all walks of life. Like Stewart, he has been granted an immense amount of privilege in his political career; however, in Kaine I see someone who has generally tried to use that privilege as a platform to unify and improve the lives of working people, not to divide or oppress them. This isn’t to say that I see eye-to-eye with Tim on every issue, or even his own brand of Democratic politics. Despite his working class roots, I do not believe he’s done nearly enough to help organized labor, nor do I believe he has truly stood up to the financial industry or the political gamesmanship within our own party. I’ve found myself disappointed by quite a few of his stances and actions (even recently,) and I wish he would help lead us out of some of the more elitist tendencies we have as a party, and instead help us reunite with our Main Street roots. In short, I respect Senator Kaine’s public service overall, but some of his stances and actions are emblematic of the challenges we face as Democrats, and what holds us back to regaining the full trust of the people we’re trying to serve. With all those cards out on the table, I’m going to make the case on why Tim Kaine is exponentially more fit to continuing his service as our senator over being replaced by Corey Stewart. While both men have served in local government, they have used that power and influence in wildly different ways. A decade ago, Corey Stewart used his newly-found platform as Chair of the Prince William County Board to declare war on our immigrant population. Under the guise of cracking down on undocumented immigrants, Stewart capitalized on racial tensions and a xenophobic national climate to promote policies aimed squarely at our latinx brothers and sisters. Documented and undocumented immigrants alike would be stopped “under probable cause” and asked to prove their citizenship status had these policies come to full fruition. In some cases, people were stopped and questioned anyway. The partial implementation of those policies – coupled with the fight between their supporters and opponents – led to a mass exodus of latinx members of our community. It not only hurt race relations in our county, but also exacerbated our county’s economic struggles near the end of the Great Recession. Tim Kaine, meanwhile, worked with community leaders from low income and African American communities in Richmond to improve Richmond’s schools and working conditions. A Civil Rights lawyer by trade, Kaine used his knowledge, connections and privilege to assist in long-standing battles to give students of color and their low income peers more resources, as well as Richmond workers more protections from discriminatory practices. His leadership and compassion culminated in him being elected mayor of Richmond by a predominantly-black city council; the first white mayor of Richmond at the time in a decade. While I don’t completely agree with some of his criminal justice initiatives – such as some of the more draconian aspects of Project Exile – gun homicides decreased significantly under Tim Kaine’s tenure as mayor of Richmond. Corey Stewart has long been a supporter of our county keeping a 287(g) agreement with Immigration and Customs Enforcement (ICE.) Under this agreement, cells and beds in our local detention facilities would be used to detain suspected undocumented immigrants, and members of our local police force would be conscripted by ICE to investigate and pursue immigration violations. Our current and immediate past police chief oppose Prince William County’s participation in this program, but Stewart has consistently led the charge in trying to keep the agreement in place. He has long-since demonized undocumented immigrants no matter their background, and has perpetuated policies that would keep barriers in their paths to realizing their full potential. He has also played both sides of issues surrounding race and religious minorities in our county; he stood on the side of those who wanted to run power lines through an historic African American neighborhood but then switched sides with the wind; he also opposed a requested sewer line hook up to a mosque in the western part of the county until he realized there would be legal ramifications. This waffling, along with his full embrace of developers, (after originally running as someone who would stand up to them,) exemplify how Stewart holds whatever position is most politically convenient at the time. He holds no permanent allies except for perhaps white supremacists and xenophobes. Tim Kaine, by contrast, has long been a proponent of comprehensive immigration reform. He agrees that we need to enforce our immigration laws and keep our borders secure, but he also understands that there is a sizable population of immigrants that need a path out of the shadows and into full citizenship. He also has long acknowledged that there are many undocumented immigrants – such as the DREAMers – who were brought to our nation as young children without any choice in the matter; the United States is the only home they’ve ever known and he has said time and time again that they deserve to stay here with their families intact. He has also voiced that he is against expending local law enforcement resources on enforcing federal (immigration) laws, and as such is against 287(g) programs. This stance shows that he is both a good steward of our local public safety resources and acknowledges the basic humanity of every person, regardless of their documentation status. Chairman Stewart’s gubernatorial campaign brought his divisive and race-driven brand of politics to the statewide and nationwide stage. Although his platform contained an economic message on jobs and a fossil-fuel inclusive energy grid, the hallmarks of his campaign were obvious gimmicks to rile up his base. 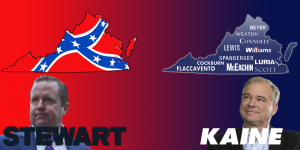 From raffling off an AR-15 to one of his early donors, to his embrace of Confederate culture, Stewart branded himself as some sort of defender of a dying “true Virginian heritage.” He also made the preservation of Confederate statues and monuments a centerpiece of his platform late in his campaign, playing on a renewed push to expose those monuments as nothing more but a tool of oppression. All under the guise of preserving history. Stewart’s narrative ignored the fact that here had been little significant gun safety legislation passed in nearly a decade, and that the Confederacy was made up of people who were willing to kill and die for the right to own other human beings as property. Or the fact that many of the monuments erected were done during Reconstruction to remind Freedmen of “their betters” alongside a series of racist policies – and an oppressive rewriting of Virginia’s Constitution – which stripped African Americans of many of their freedoms and liberties. As a descendant of those slaves and their Freedmen children, and a student of history, I find the hypocrisy in Stewart’s stances on these issues astonishing and infuriating. That fury is fed by the fact that Corey played a pivotal role in emboldening the organizers of last year’s Unite the Right hate rally in Charlottesville. A rally that claimed 3 lives, traumatized a generation of people of color and other vulnerable communities, and revealed a new generation of Neo Nazis, Klansmen, and their white supremacist brethren in our society. Stewart parroted President Trump’s narrative of “very fine people on both sides” of the rally, as well has the moral equivalency between actual Nazis and their Anti-Fascist opponents. It also took him nearly a year to condemn white supremacist Jason Kessler, one of the architects of the rally who will be leading an anniversary hate rally in Washington D.C. this weekend. During his time as governor of Virginia, Tim Kaine strove to create an economy that worked for all Virginians, regardless of the color of their skin or their socio-economic background. Working with the General Assembly, he also championed several criminal justice reform initiatives aimed at reducing the school-to-prison pipeline and beginning to address mass incarceration. He was more than aware that our criminal justice system disproportionally targets and disadvantages people of color, and sought the hard road of beginning to correct that injustice. He held roundtables in Richmond and throughout the commonwealth, bringing together faith and community leaders, law enforcement professionals, and criminal justice. These roundtables gave him varied perspectives, but also created a space for people on various sides of a critical issue to sit down and find common ground. In the wake of the Virginia Tech shooting, Then-Governor Kaine spent much of his time with the families of the victims, and then devoted much of his political capital seeking bipartisan solutions to gun violence. Gun control advocates, gun safety champions, and staunch Second Amendment supporters were sought out and brought together under the common cause of trying to curtail gun violence and mass shootings. Again, Tim Kaine sought varied perspectives and created an opportunity for people who usually found little agreement to create consensus. In the wake of the monstrous demonstrations in Charlottesville last year, Senator Kaine did not hesitate to condemn the white supremacist terrorist organizations who participated in the hate rally. He also signed onto a resolution condemning them as well, while also calling upon state and federal agencies to ensure there are proper resources to monitor and combat these groups wherever they may rear their ugly heads. He did not try and play both sides of the debate, nor did he try to draw moral equivocation between Klansmen and those who stood against them. Time and time again, Senator Kaine has shown himself to be a unifier for the common good, rather than dividing our society or preying upon people’s fears for political expediency. This year, both candidates continue to show us who they truly are. Corey Stewart continues to be derelict in his duties to our county while running to be the last Confederate Senator of Virginia while Tim Kaine runs on kitchen table issues. While Stewart continues to run on the xenophobic policies of division rooted in culture wars, and promoted by President Trump, Tim Kaine continues to provide a vision of economic opportunity, healthcare, and security for all Virginians. I don’t agree with all the provisions of Tim Kaine’s platform (such as, I think he could be bolder with his Medicare X and Economic Justice platform planks) but it is still a statement of values on the Virginia we should be, and the direction we’re heading. This November, the choice between our two U.S. Senate candidates couldn’t be clearer. Corey Stewart wants to take us back to a time when the color of your skin, or your ability to prey upon society’s fears, determined your lot in life. Tim Kaine wants to keep us moving forward as a society that seeks to embrace our differences rather than shun them, and toward a horizon that seeks a more perfect Union. My heart, my mind and my blood demand that I vote for Tim Kaine on November 6th. I hope you’ll join me.